Bayer Diabetes Care has announced its new DIDGET blood glucose monitoring system, which the company claims as the first and only blood glucose meter intended for kids aged 5-14 with diabetes that plugs into Nintendo DS and Nintendo DS Lite gaming devices, based on Bayer’s trusted CONTOUR system, aiming to transform kids diabetes experience by tapping into their existing passion for video games to encourage consistent blood glucose testing with reward points that children can use to buy in-game items as well as unlock new game levels. Bayer’s DIDGET that includes Knock ‘Em Downs: World’s Fair video game and Mini Game Arcade will also connect to a new password protected web community – Bayer’s DIDGET World (coming soon! 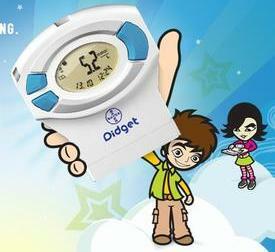 ), where children can earn reward points for blood glucose test results and create their own page.